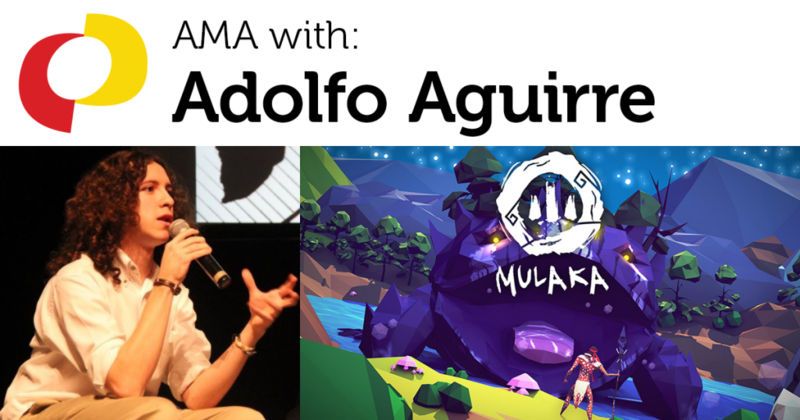 This is a transcript of an “Ask Me Anything” (AMA) session with Adolfo Aguirre, hosted by the IGDA Student SIG. If you’re interested in doing an AMA with students, you can sign up here. Hey Adolfo, you agreed to do a text-chat-only AMA right? If so, then we’ll just keep everything in this channel. Yes, text chat works best for me at the moment. For context, I’m head of PR & Publishing at Lienzo, a studio in Mexico, where we just launched Mulaka for the Nintendo Switch, Xbox One, PlayStation 4 & PC. How big is Lienzo? Do you think of yourselves as an indie studio? But we don’t really like to tag us as a “small” studio anymore, because we want the region and projects from here to stop being perceived as small, there’s a lot of potential for cool stuff. That’s good. I’ve spoken to a few other local chapters around the world who were thinking about the same problem. Pretty cool to have a Switch game from an 8-man team, you guys did a lot, Mulaka looks cool. Was it difficult getting it onto the Switch? Well, it certainly wasn’t easy, but it was far from impossible. A big challenge was getting noticed by Nintendo since right now everyone wants to be on the Switch and the Switch gold rush is very much a real thing, but we kept insisting everywhere and we managed to connect with the right people through Twitter and that was it. They would be crazy not to pick this game up, it’s right up their alley. On the technical side, we did face some challenges with optimization, but they were far more simple than what we expected. We worked with Unity, so that really made things go smoother on that due to its compatibility. So at Lienzo, you said you are the PR & Publishing guy, but you also do a lot more, like QA and community management. Now that the game has shipped, what’s taking up most of your time now? Are you working on a lot of marketing and promotion for the game? Since we’re a small team, all of us take a lot of different roles. For instance, one of our programmers is also the writer of the game, the cinematic producer, and the video producer (for trailers and such). My main responsabilities are PR and publishing, but I do QA, marketing, community management, etc. At this moment, I’m spending more of my time on answering interviews (PR), replying to emails and messages (community management), public speaking at events (marketing? ), and a few more things on the publishing side that I can’t talk about yet. So a bit of everything, basically. A lot of beginners think that once the game is shipped, all the real work is done, but I guess my core question is to ask for a picture of what your post-release work has really been like. A bit of both. We’re maintaining the game by fixing bugs and we already added a feature and improved some stuff based on player feedback. We’re also starting a new project, and that involves a lot of discussions internally, but our programming team is definitely spending the majority of their time on updates for all the platforms where the game is available on. Games are no longer “shelf products”, they’re basically living things in the market that you must support to maintain sales and keep a goodwill with your customers. So how long did it take to make all this artwork with just 2-3 contributors? It’s a pretty impressive variety. And yeah, i hear that. it’s all about that long-tail. related, how long was the game in development? Production took a bit over two years, the whole team, including art. We spend over a year before that looking for funding, doing concepts, research, etc., but full-time production, and with that I mean all of us from 9 am to 5 or 6pm at the office, Monday through Friday, took us just a bit over two years. How’d you get funding? What kind of investors? Any publishers? We did a Kickstarter back in 2015, but it was unsuccessful. That Kickstarter, however, gave us a lot of attention and exposure with media, especially within our country. We then managed to secure a small fund from our city hall, then a larger government grant from the federal government. With that support, we became more attractive to investors, and managed to get the full funding for the studio, not just this game. So we basically made our dream true of working full-time on this, with salaries and all, and that came from people who are outside the industry. Government grants are surprisingly common among small companies. It’s often from funds dedicated to either fostering a stronger local tech industry, or local arts & culture companies. When and how did you join Lienzo? Did you work on previous game projects? What’s the local games industry like? Are you in touch with other companies in the country or in your area? The local gaming industry is almost non-existent, to be honest, but it’s slowly growing. Haha, that’s exactly what I said in my head: “probably non-existent.” I’m glad they funded you. We’re connected with almost every studio in the country and try to make friends with all of them because we need to lend a hand to our fellow devs, wherever they are. But as of now, there isn’t much happening. It’s slowly getting there and we’re seeing more new studios being born, some of them even inspired by what we did, which is our main goal, but it’s still a very small scene. I heard Rami Ismail talking about how every local games industry usually needs at least one “big” hit before people start to take it seriously. For many people, we’re that “big” hit, and we hope that does make a difference and that five years from now we can be talking about several games being made here. Is the IGDA Mexico chapter still around? they used to have the http://igda.mx domain which I thought was really cool. Funny thing that you asked, since we tried to “revive” that, be part of it and even take some leadership and push it forward. It exists, but it’s not doing anything. Dunno why, but on paper there is someone in charge of it, but nothing is happening. As far as we’re all concerned, at least. Devs in Mexico instead associated under different banners and such. yeah that happens to a lot of local chapters. Eventually some volunteers will get busy and if they don’t immediately hand it off to new volunteers, then it dies, then someone revives it, then it’s active for a while, then the cycle continues. ah, what are the main professional groups in Mexico? Are they more regional? It’s always more complicated when it’s run by volunteers and I understand that. It requires time, and time is money. There is an Mexican Games Association that is fairly new. that’s awesome. Do you have a link to it? That’s precisely what I’m looking at right now, but for some reason, the website is only in Spanish. Ugh. Oh, but the industry report is in English. It’s very tough to get government grants. The Mexican government isn’t too interested in it and are of the idea that games are harmful to children and instead want to impose restrictions and such. The money we got from government was due to the game’s subject matter, not much because of the fact that it’s a video games. What are some of the other challenges that game studios in Mexico face? Is it mostly the lack of a strong scene, and therefore not having the accumulated knowledge and experience of other regions? It’s way tougher for us to attend events like E3 and GDC. The exchange rate and purchasing power we have versus Americans really screws us badly. You think San Francisco is cheap? Attending GDC just one year is a significant portion of a game’s budget for us. For many studios over here, it’s either going to GDC or making a new game. They cost the same. Even living right here in Everett by Seattle I can relate to that. Rent comes first you know, so it’s been a couple years and I haven’t been able to make some events. It’s a barrier for sure. And I can imagine it felt pretty cool to get that grant because they’re not just handing them out. Hard to get exposure with so many people in the games-game, too. It’s a competitive industry, for sure. This happens in the US, too, but I believe that the taboo around games is greater around here. We’re either rockstars or weirdos, that depends on who you talk to. *Oh nah man people are nuts but I think like %80 of us are addicted to one game or another. That’s rough. I grew up in a pretty traditional area so I did experience some of that. By the way, I met you at GDC but I don’t remember where exactly… was it the Speaker party? Did you speak at the conference this year? @Livio Huh, not sure. Maybe at Indie Megabooth? I didn’t speak at the conference. Good luck with Mulaka, I’ll tell people about it if they’re into adventure games. My sister might pick it up. I was at that party, too. Maybe that was it. No problem! Thanks a lot for having me.